Well it is that time of year again! 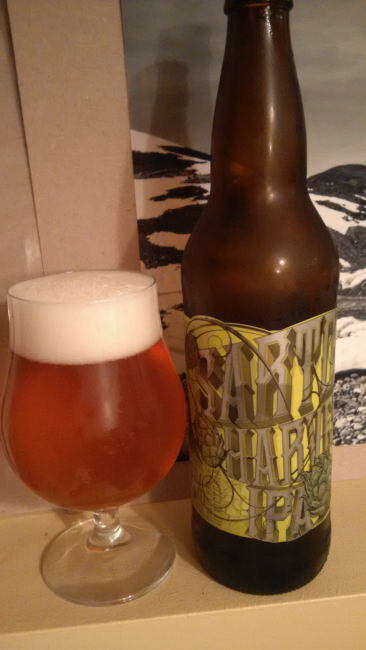 Driftwood Brewing out of Victoria BC has brought us their 2014 version of their wet hopped “Sartori Harvest IPA”. I actually got my two bottles of this years batch a little late as I was over 700km away when it was released on a road trip to the Kottenays. Luckily I was able to have a few bottles squirreled away for me as like always this beer fly’s off the shelves before most people realize it has even been released. This year the beer took a huge direction change with the label! From the nice subtle look of the original to the in your face version this year. Like every year all hops used in this brew were picked at the Sartori Cedar Ranch in Chilliwack and brought back to Victoria and put into the brew kettle without drying them (most hops is dried and turned into pellets). This process adds a different flavour than drying out the hops and making pellets. This also means that the hops oils are much less stable in the beer and the beer should be consumed asap and not held onto. This beer will have a very short shelf life even to what a normal IPA should have. As can be guessed by the sudden glut of wet hop or fresh hop beers suddenly on the market the hop harvest just happened very recently! Fall is an exciting time for hop heads! This years batch pours a golden colour with a white head. The aroma consisted of earthy and floral hops, with not much shining through beyond that. The flavour was of huge earthy hops flavour with pine, hops bitterness, resin and some mild sweetness either from the malts or citrus. I don’t know if it was just my two bottles or if this was production wide but this years batch was far less balanced with very little malt or fruitiness of any kind coming through. I found it almost more of a fresher Fat Tug IPA this year. The alcohol content comes in at 7% this year and I would suspect the IBU would come in similar to the last two years around 75. To me it seems to be much more than just a label change this year but a entirely new beer. Don’t get me wrong it is a good beer but it is not what I have come to expect over the last couple of years of Sartori Harvest releases. I will not be hunting down any more bottles which in a way bums me out as usually I am on a mad hunt for as many bottles as I can find of this brew. Maybe this is just my experience and I hope that is the case. Luckily with beer it is all up to the individual person drinking the beer! Maybe I have just come to expect to much with this release and I do not mean to be a buzz kill Driftwood as I know this is a huge release for your every year but this years version just wasn’t my taste. This entry was posted in India Pale Ale and tagged bc, beer, bitter, bitterness, canada, chilliwack, craft beer, driftwood brewing, earthy, fresh hop, fresh hopped, hopped, hops, hops bitter, hops bitterness., hopy, huge earthy, india pale ale, IPA, mild sweetness, pine, resin, sartori cedar ranch, sartori harvest ipa, sartoria harvest india pale ale, victoria, wet hop, wet hopped. I share your sentiment, good but not great. Sometimes in general I find fresh hop beers a bit too oily, however I think this also suffers a bit from being a single hop beer as well. Still decent, worth buying at least one if you can find it. I am more curious to see what the other local breweries have come up with again if I can find them! It’s to bad as I was a huge fan of the last two years batches. I liked what Powell Street did this year. I agree that this year’s batch doesn’t seem to meet up to the annual expectations. It is a delicious beer, but not what has been anticipated. The weather this summer would have played a large role in the crops and the development of the hops. Like everything harvested in the agricultural industry this year. So I wasn’t surprised that this year’s Sartori wasn’t as…much as it usually is. Makes sense. you make a good point about the weather and harvest.